When Subang Jaya State Assemblywoman Hannah Yeoh and her husband Ramachandran Muniandy decided to register their newborn daughter as “anak Malaysia”, nobody told them that it would unearth deep-seated insecurity in Malaysians’ attitudes towards race. Hannah believes that there is a sizeable amount of Malaysians who – like her – prefer to be identified as Malaysian and not ethnic Chinese, Indian or Malay. Hannah traces this attitude on the system of racial labeling which has become a ‘stronghold’ in the way this country functions. “Race is at the core of each Malaysian’s identity from the moment they are born. 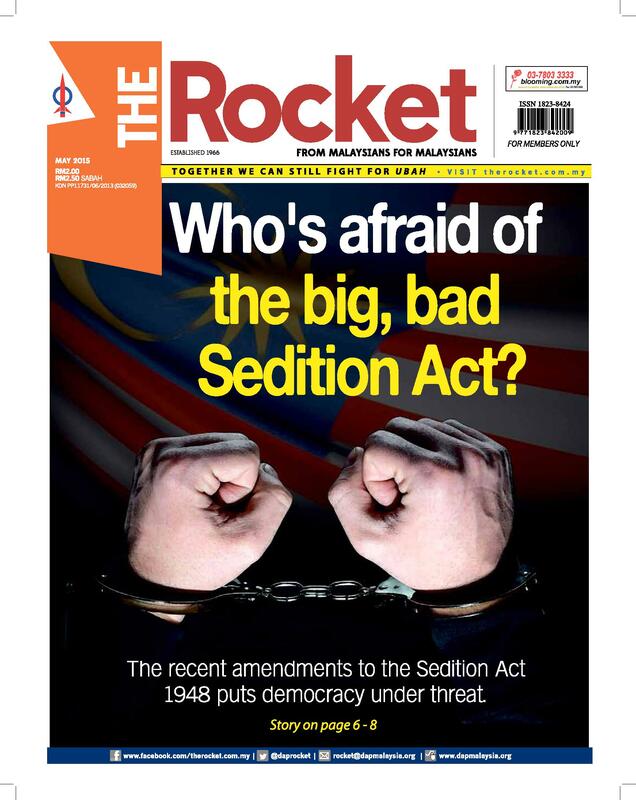 Everything revolves around which category you tick in the box for ‘race’ in Malaysia,” the former lawyer told The Rocket. Hannah points out that a Malaysian going overseas who describe themselves as being ‘chinese’ would find themselves being mistaken for being a China national. Asked what would make Bangsa Malaysia a reality, she replied that Malaysians must abandon the argument of race. “Our sense of security in our identity must not be rooted in skin color. It comes from knowing who you are… your relationship with your Maker and your loved ones… being empowered by that. I don’t believe I depend on my skin color for anything,” stressed Hannah. Describing an example of unity, she relates the story of two best friends and former schoolmates, which she calls a tale of “the real 1 Malaysia”. Wheelchair-bound Chin Kit is best friends with Azizul. Despite living in Pantai Dalam, Azizul would travel all the way to USJ 1 in Subang Jaya just to spend time with Chin Kit. They hang out together and often share a taxi to go shopping. Azizul, who suffers a disability to his hand, would carry Chin Kit in and out of his heavy wheelchair. “In a country with no natural disasters, we often take unity for granted. But these two friends with disabilities had to depend on each other for survival. There is no room for discrimination when we need to depend on each other,” Hannah added. Quoting blogger Nathaniel Tan, Hannah exhorted parents to be mindful of their choice of words when speaking about those of other races. “Don’t be an Ibrahim Ali at the dinner table, your children will easily pick up stereotypes,” she said. Hannah believes that leadership is the key to breaking racial stereotypes. She added that Bangsa Malaysia would not happen if teachers continue to be trained by Biro Tata Negara, or if political parties are race-based. She rapped Prime Minister Najib Tun Razak for spending millions on branding to promote the 1 Malaysia concept “without sincerity”, and not living up to expectations. Hannah said that the slogan is without substance if the Prime Minister does not take action against incidents of racial intolerance. For instance inflammatory remarks by Perkasa president Ibrahim Ali; or the recent 8TV Ramadan Public Service Announcement Advertisements – which she describes as “tasteless and condescending”. Hannah warned against an attitude of “sweeping things under the carpet”, as over time, the accumulated sensitivity will explode. 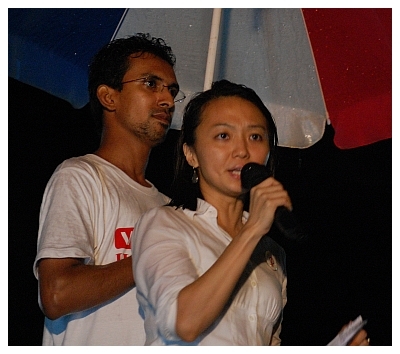 She supports DAP National Chairman Karpal Singh’s suggestion of legislating a Race Relations Act. The 32-year-old says that she always strives to emphasize inclusiveness in constituency allocations and programmes organised by her kawasan. “For instance, in the Subang Jaya Talent Quest competition, we required group participants to be multicultural and not just made up of members of the same race,” she said. Hannah – also known as Yeoh Tseow Suan – decried that mono-racial friendship has become second nature in an increasingly polarised society. She described the phenomenon of adults gradually having fewer friends of different races as being “unhealthy”. This article was written by admin on Thursday, September 8, 2011 at 4:46 pm. You can follow any responses to this entry through the RSS feed. Both comments and pings are currently closed.